Hirsch and Ella had 12 or 13 children, but only nine survived infancy. Of these, three were girls and six boys; Ette, Ress, Louis, Issie, Alec, Rochel, Max, Mannie and Sydney. All the houses in Skud were built of wood because there was a forest outside the town. The Judelman house was on a plot of land of about eleven acres. Everyone was born in the house, which was rebuilt at a later stage. One side of the house had two rooms and other side four rooms. In winter, when it was cold, they used to bring the chickens into the kitchen and put them near the stove to warm up. They had a big garden at the back where they used to grow all their vegetables. They had a cow that provided them with milk. A Lithuanian woman servant helped in the house. Their house was in New Town, down the road from a farmers’ market, which was held on Mondays and Thursdays. A river separated the old town and the new town. Once, the wooden bridge was washed away. For weeks no one could get across. 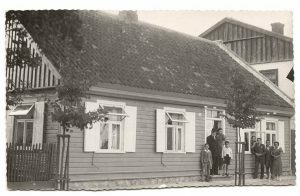 Childhood in Skud was filled with parties and playing together. The men would lay tefillin every day. There was a big service every Friday night and Shabbos morning. Lots of travelers came through the town. They used to stop for Shabbos, come to the shul and sit at the back. People knew they were travelers and would invite them home for meals. Every Friday night local families had guests. There was a bakery close by. Jewish families used to put their food in the baker’s oven before Shabbos and collect it on Shabbos morning. They always had extra kugel. The Jews felt there was no future for them in Skud. There was no life for the youngsters. Some of the children had schooling for a while, but this was disrupted by World War l. They went to mixed schools, where the language was Hebrew and German and a little Russian. There were no high schools initially. Sydney went to high school. Louis immigrated to South Africa just before WWl. He worked for Harry Speech for the first 2 years and didn’t earn anything as he had board. He then earned 2 pounds per month of which he sent one pound per month back to Lithuania to bring his brothers over. The other pound he used to live on in Johannesburg. After the war, Lithuanians formed an army and everyone had to enlist. Issie wanted to go to South Africa so he avoided getting drafted and lay in hiding until his papers were issued. He then left with Alec and Ress. On the way to South Africa, Ress, Alec and Issie went to Memel and visited Paula Merkel, a cousin. They met a family named Golden. Leo Golden had a shoe store. He knew the Merkels and met Ress, who was very pretty. He told Ress she should stay and marry him. Alec and Issie continued their journey without Ress and arrived in South Africa in 1922. Max went to Memel to work in a shoe store in 1926. When he left for South Africa, Mannie took over his job for the years 1926 to 1929, until Mannie, too, left for South Africa. He was 21 years old when he arrived in South Africa in 1929. Once the older brothers left, only Sydney and the three sisters remained. In 1939 when World War ll broke out, Ress and Leo went from Memel to Skud on their way to South Africa. They couldn’t get permission to immigrate to South Africa, but they did manage to get into Southern Rhodesia. Hirsch stayed alone in Lithuania. The children in South Africa used to send him money every three months. They took turns in sending him £5. Mannie had a document from the bank showing it was his turn to send money in April 1939. 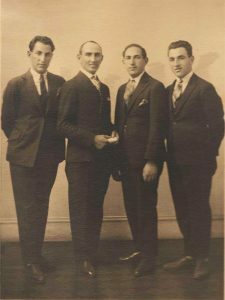 Their sister had wanted to take Hirsch to South Africa, but he resisted because he would have had to drive to shul. One of the sisters, Ette, married Yankel Melamed in 1927. Ette later died young from pleurisy. One of the sisters, Rochel, married Harry Kaplan and lived in Riga. They had three children. During WWll, the whole family was taken to the forest outside Riga and shot. Hirsch was killed in 1941, along with all the rest of the Jews in Skud. All the brothers arrived in South Africa and started working one after the other at Harry Sneech’s general store in Edenvale. Louis worked for Harry Sneech but did not earn any money for the first two years. He worked to cover his board and lodging. They lived in a house in Elandsfontein next to what is now Maxman Centre. Max had a café eating house on Jules Street, Malvern, in Johannesburg. 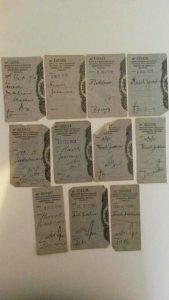 Around 1940, someone owed Max money and couldn’t pay, offering as part payment a brickyard on North Reef Road, Germiston. The brothers renamed it Jaybee Brickworks. Initially Alec and Max ran the business; later Issie became a partner, even though he had a shop in Elandsfontein, where he spent most of his time. Louis had a general dealer’s shop in Benoni called Judelman and Frankel (cousins). Louis eventually gave up the shop and joined the brickworks as well. Mannie ran a general dealer’s shop with Morris Shaff in Edenvale, called I. Davidson & Co. He also had a brickyard called Germiston Brickworks in partnership with Shenella’s brother, Ivan Katz. Mannie spent most of his time in the shop. Sydney had a shop in Lyndhurst, also a general dealer’s. Sydney built some shops and flats in Lyndhurst. Alec had the Delmont hotel in Elandsfontein with shops adjacent to it. It was built in 1952. Max started building factories on Jaybee Brickworks ground in the middle of the 1950s. He started Maxman in Elandsfontein in 1957 with Mannie as a partner. They built factories from 1954 until the early 1980s. Issie and Alec bought the ground next door as well as developing the Delmont Hotel and adjacent shops. Jaybee Brickworks was on North Reef Road. [Was it called Main Reef Road or North Reef Road, as suggested at the top of this page?] They used a machine called a pug, with a horse pulling the machine that ground the clay to make the bricks. Making bricks was labour intensive. Each delivery truck had eight laborers and a driver. The brothers would not mechanize the delivery as it would have put laborers out of work. Alec was the actual brick maker and together with Max ran the business. In the 1960s they sold the land that belonged to Alec and bought land at A. G de Witt Drive, Fishers Hill, Germiston. They operated the brickyard there until it closed down in about 1986. The land was sold for a residential complex in the early 2000s. 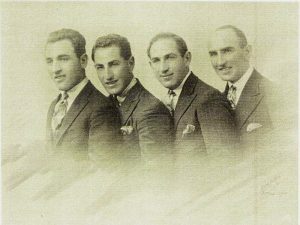 Alec, Issie, Max and Mannie lived in Kensington and were members of Kensington Shul. They supported the shul, and Max was on the committee. In 1952, a new Shul was built. Louis lived in Cyrildene and was a member of Cyrildene Shul. Sydney lived in Sydenham and went to Sydenham Shul. 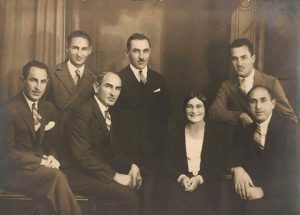 In the early years, the six brothers and their wives met regularly. The cousins all played together. They got together for all the chagim and every simcha, and feribles were unknown. The brothers worked together, and problems were shared by all. They were known to have lunch together every day at Jaybee Brickworks. Whenever a business or investment opportunity arose, all members of the family were informed and invited to participate. Alec always spoke with pride of the “meshallochim” who would pass Jaybee on their way from the airport to Johannesburg and collect funds for organisations in Israel. They were never refused. Although only Louis was religious, all the brothers were strong Zionists.